Did you know that March is National Craft Month? 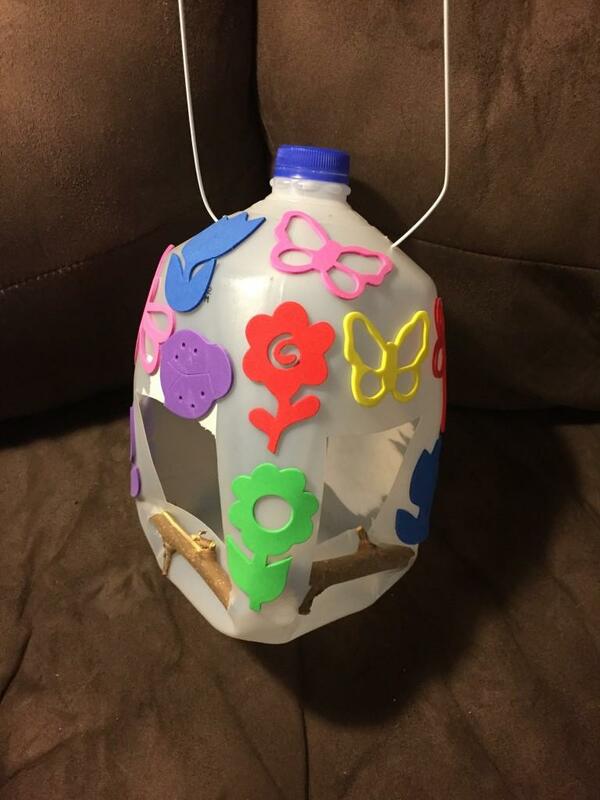 There are so many cool crafts that you can make with your kids. 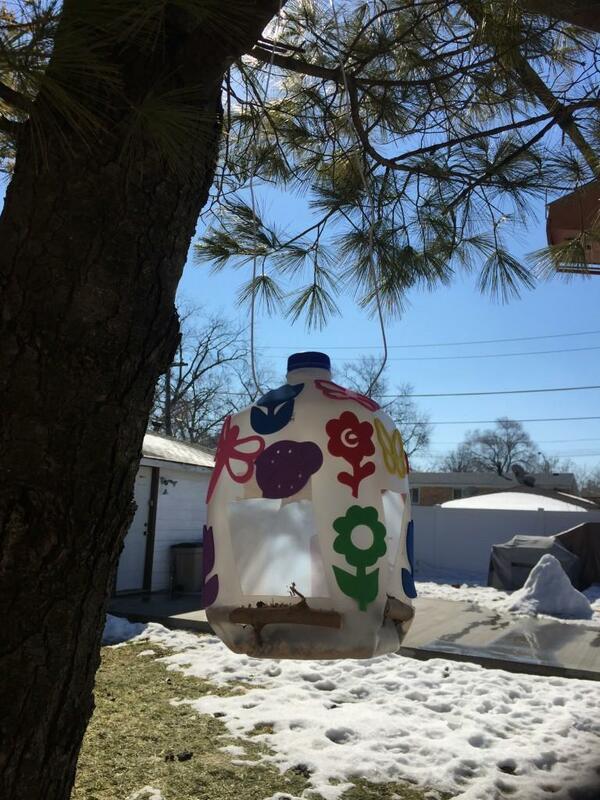 With Spring right around the corner, the kids and decided to take an empty Tampico jug and make bird feeders! This is an easy craft that you kids can make and show off their creativity. When you are finished, you can hang it outside! 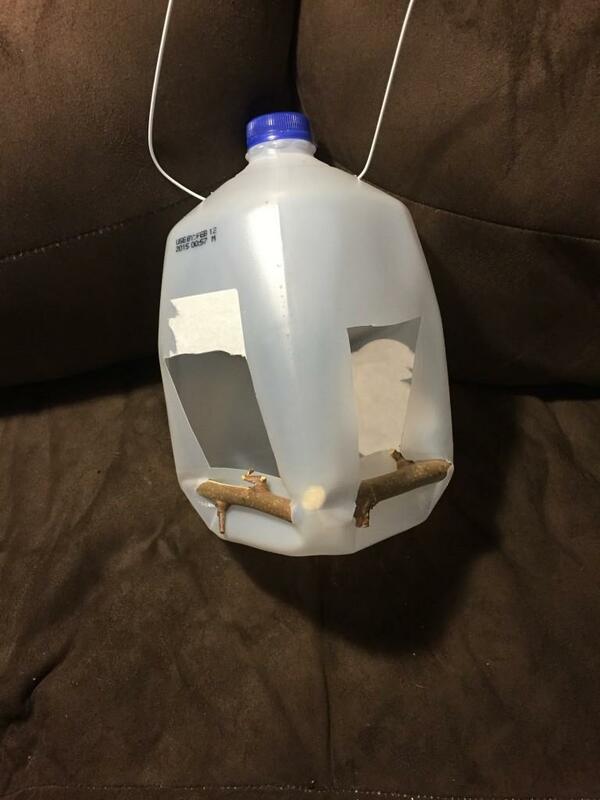 Best of all, a Tampico Jug Bird Feeder can easily be made with things you have around the house. 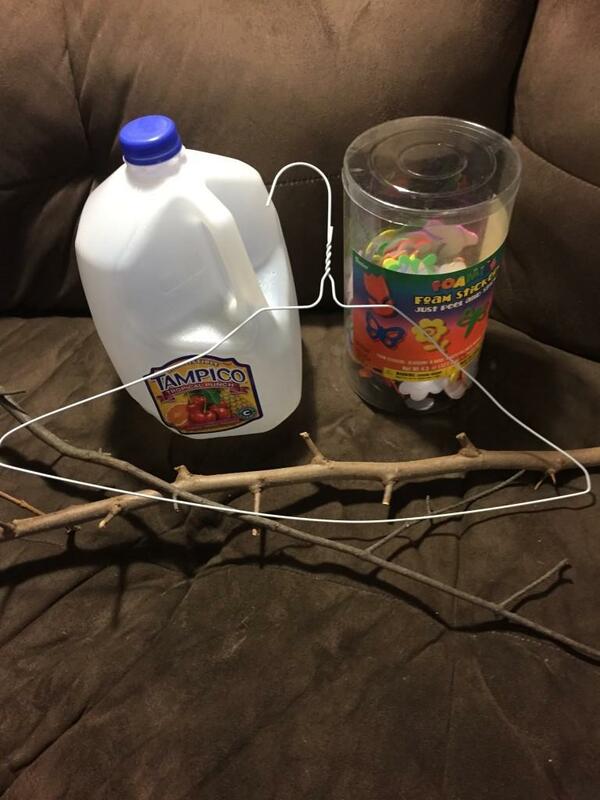 We used a hanger, an empty Tampico jug, sticks from my yard, and some leftover stickers we had from other craft projects. Once you have all your supplies, make sure you wash out your Tampico jug. I also removed all the labels. It just makes for easier decorating. 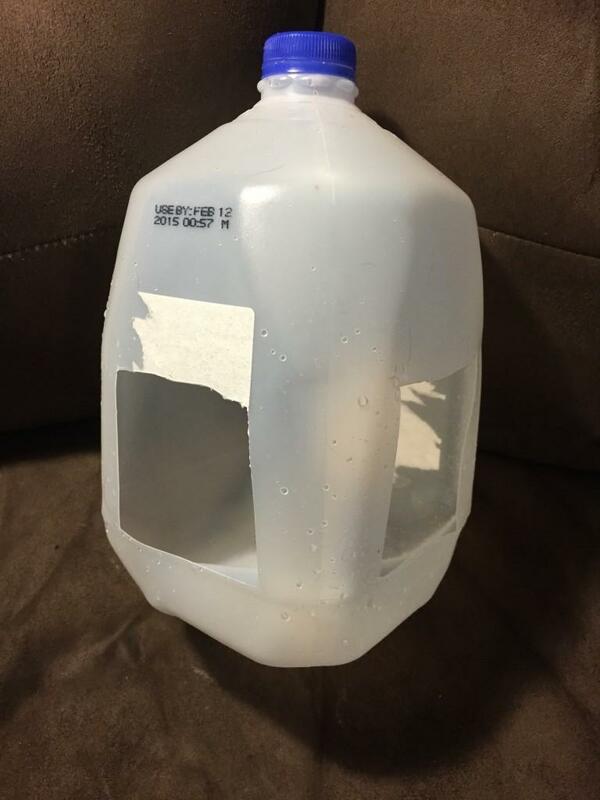 Next, cut “windows” into your milk jug. I used the sides opposite the handle. This may be something you’ll have to help the kids with depending on how good with a scissors they are. Next, you need to figure out how you are going to hang your bird feeder. We have very old tall trees in my yard. 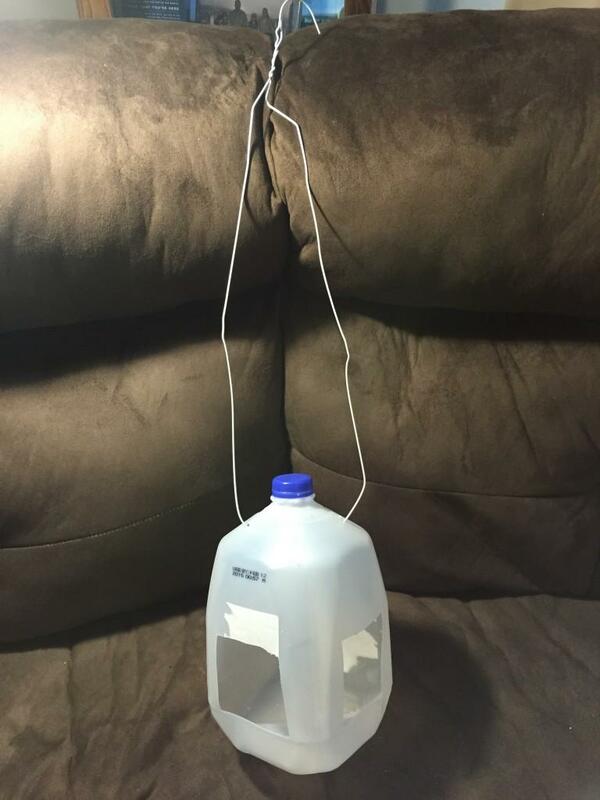 I used a wire hanger to hang our bird feeder. However, you could use a smaller hanger or twine. You then need to puncture two holes near the top of the jug to thread the hanger through. I then twisted the hanger back together and stretched it out so I can hang it. We then added a perch. Cut slits to each side of the window. Trim your sticks to a length just beyond the slits. You then maneuver the stick into each opening and glue into place. This was one of the most time consuming parts of this project. The kids choose to decorate their Tampico Bird Feeder with stickers. You could have decorated with anything though – markers, modge podge, etc. This is when the kids can show off all of their creativity. 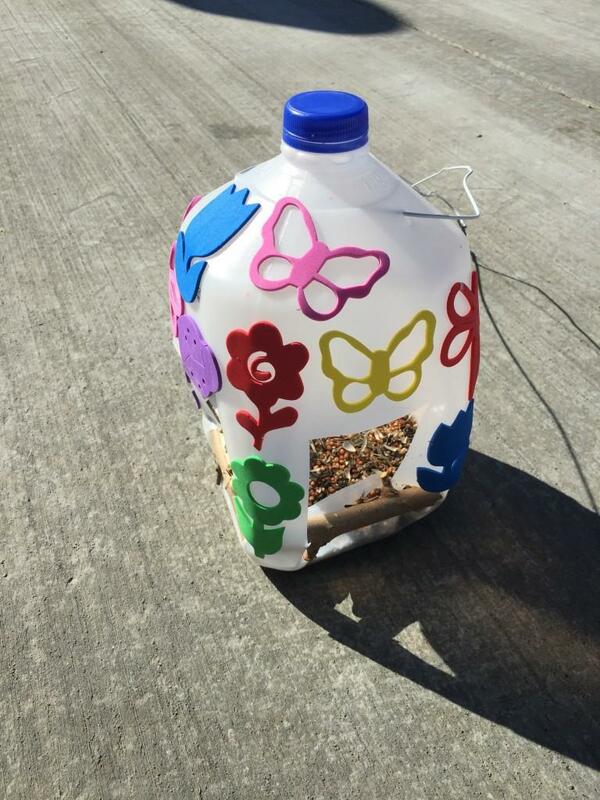 We then carried our Tampico Bird Feeder outside to fill with bird seed. Lastly, we hung our Tampico Bird Feed outside! As you can see, that long hanger came in handy! You can also see that we still have snow here in Chicago! That being said, I know that the birds will certainly appreciate the kids project! Are you making any crafts for National Craft Month? How’d the kids and I do on our Tampico Bird Feed?